My name is Molly Hulseman, and this is my first year with the Summer Of Solutions team. 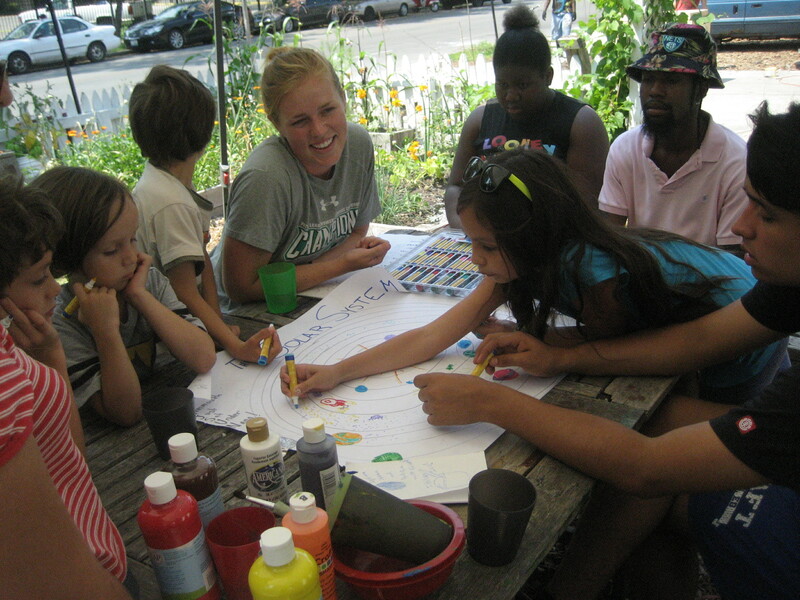 I am working with the Children’s Garden at the Koinonia house on Ashland. My schedule is different than most summer participants in that I come to SoS just on Mondays. The kids picked herbs and other foods growing in the Children’s Garden to add to their pizzas. We are almost 1 month into our program. It began slowly. No children showed up the first day of children’s garden, but the week after we had as many as 15 kids at the garden. Children’s garden has been going along very smoothly! 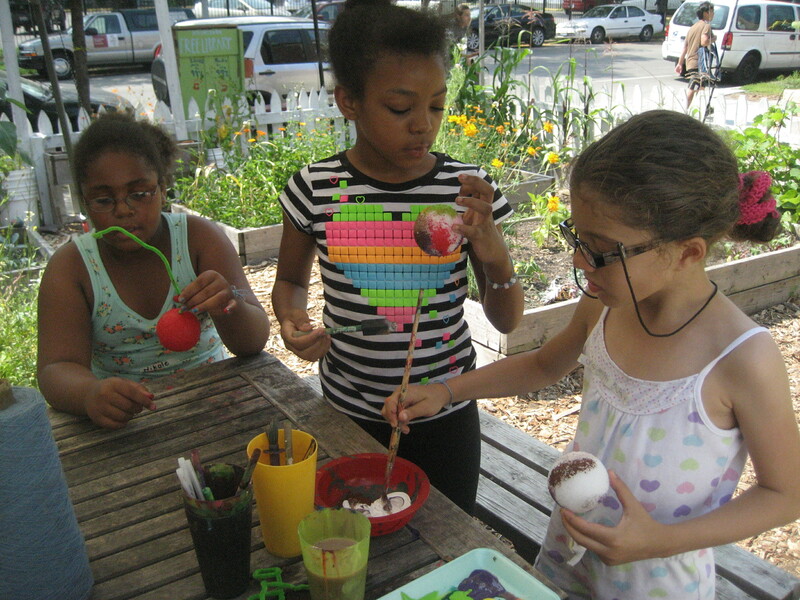 The goal of the children’s garden is to teach the kids about the importance of plants, organic foods, and growing crops in a city. Each week we decide on a theme, and teach basic lessons on the themes that we have chosen. In our first week we talked to the kids about the water cycle as well as how water allows plants to grow. The next week we talked about the sun’s influence on plant growth. This week (the third week) we taught the kids about the solar system. We taught them ways to remember the solar system. For example MVEMJSUN (My Very Enormous Mammoth Just Sat Under Nana) was how we remember the order of the planets. We also explained to them the reason humans and plants can grow on earth is because of its place in the solar system. In their first activity we had them paint their own planets. 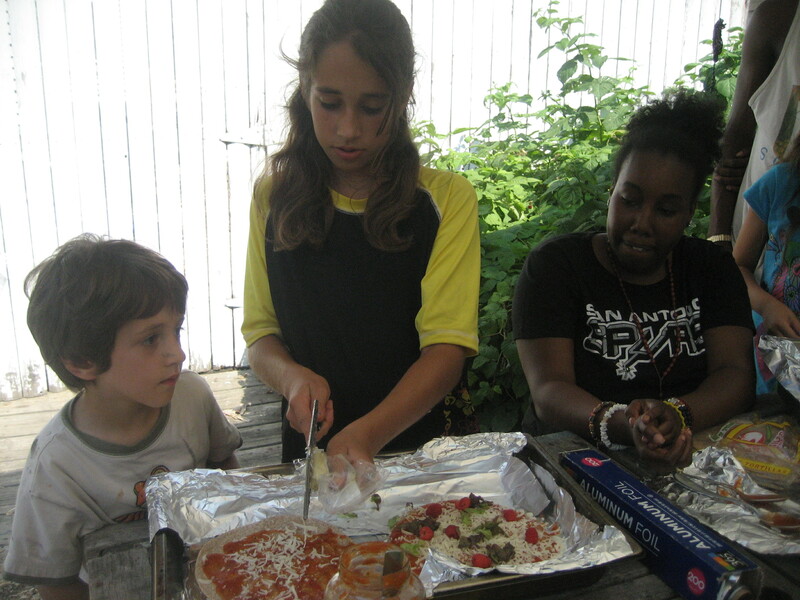 Then we cooked pizzas from flour tortillas, pizza sauce, cheese, and whatever they wanted to pick from the garden. Lettuce, chives, onions, and even raspberries were added to some of the pizzas! We ended the day by letting the kids water all the plants in the garden. It was a refreshing way to end the hot day! The children are learning about the planets in the solar system. Here the kids are drawing what they imagine the solar system looks like. My favorite moment in yesterday’s solar system lesson was when the kids had a chance to draw on the solar system map. With the solar system at the center of the table in the garden, all of the kids had a chance to drawn on the solar system. I asked them to draw extra stars, spaceships, and even aliens on Mars. They all jumped in excitement when I asked them to draw aliens on Mars, almost shoving each other out of the way! We had to tell them to do it one at a time! It is always a rewarding experience when you can get kids excited about an activity. This experience so far has been very rewarding for me. I came into this program knowing very little about gardening or growing plants. I have learned the true value to growing organic fruits and vegetables. I also have learned that so far I have so much more to learn. Teaching is a great passion of mine. I love when I can teach with students who want to learn. These kids just love to learn! This program has opened my mind to many possibilities to making a brighter, greener future for myself. I am so thankful to be a part of this group of people. I truly believe we are helping improve this city, one seed at a time. We are making models of planets. This entry was posted in Local Programs by letsgochicago. Bookmark the permalink.